As alien encounters, such as a mothership crashing into the Pacific, become harder to conceal, and the threat of Anubis continues to grow, the Pentagon makes the decision to reveal the existence of the Stargate Program. Ambassadors from Great Britain, France, and China join representatives from Russia and the US, including Colonel Chekov, General Hammond, and Major Davis, in a top secret meeting at the Pentagon. Their goal is to form an international coalition that will better enable Earth to defend itself against Anubis. 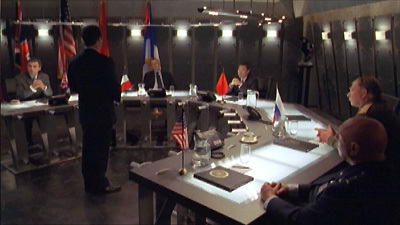 However the ambassadors are skeptical to learn of the existence of the stargate, and of the Goa'uld threat. When Senator Kinsey arrives, he accuses the SGC of contributing to Anubis's rise to power, and of repeatedly placing Earth at risk. Hammond points out that it is the SGC that has saved Earth from destruction, and he asks for the cooperation of the other represented nations, stipulating that the existence of the stargate must remain secret. However, the ambassadors are outraged to learn of captured alien technology used in such programs as the X-303, and they are suspicious of the US-Russian alliance and distrustful of the military involvement. They insist that their governments will demand full disclosure of the program. Senator Kinsey reveals his true agenda when he attempts to use international pressure to move the SGC from the authority of the Air Force to the NID, over which he has direct control. However, Hammond has one remaining ace up his sleeve. He contacts Thor, who materializes before the astonished ambassadors, and credits the SGC with saving both Earth and the Asgard. Thor insists that as allies of Earth, the Asgard believe that Earth's interests are best served if the stargate remains under the command of Hammond and the Air Force. His words convince the ambassadors, who readily agree to support the Stargate Program. Ambassadors from China, Britain, and France, were summoned to the Pentagon by the US in the interests of disclosure and international cooperation to be given background information on the Stargate Program in an attempt to create a coalition to defend the entire world. At the suggestion of Thor, the program will not be put under the control of the NID, but will remain under the control of General Hammond and the USAF. Senator Kinsey is moving from his position as Chairman of the Appropriations Committee to the Intelligence Oversight Committee, which would put him in a position of direct power over the NID. Thor came to install Asgard-designed shields and weapons on the Prometheus as a small token of thanks for SG-1’s recent efforts in securing both our galaxy and the Asgard galaxy from certain destruction. The X-303 was built as a viable countermeasure to the Goa’uld mothership. It was designed to carry a complement of eight X-302 fighters, and is one of several planned. Research and development of the hyperdrive alone has cost over 2 billion dollars. The Russian submarine Rostov was less than 75km from the impact of a meteor. The shock wave caused severe damage and she sank to the bottom. In the spirit of international cooperation, a deep submergence rescue vehicle was sent from Pearl Harbor. Unfortunately the Rostov’s reactor went critical before the vehicle arrived on the scene. Anubis is currently consolidating his position among the other System Lords.